There was a llama at work today. It was the ribbon cutter (or more precisely, the carrot chewer) at the opening ceremony for the Carson Street Zappos office opening. See below. I’m so happy for you out there. Thought of the Llama dance you shared with me when I posted this. And dancing is a relative term. It was for the Zappos Vendor party. Well, not for it, but during it. Who came up with the llama idea?? No idea. That one was real, but there is a llama motif. 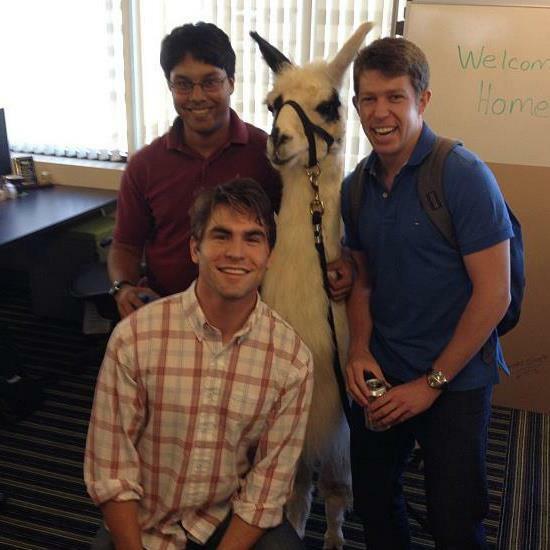 There is also a stuffed llama making the rounds around Zappos. Did you let everyone know that llamas are indigenous to India? I did not… Next time.